The Honorable. Donna M. Christensen retired from the U S House of Representatives in 2015 where she served nine terms (18 years). 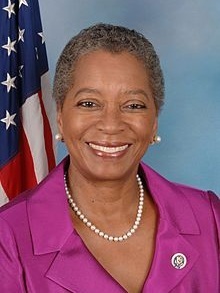 She is the first female physician to serve as a Member in the history of the U.S Congress. In the 111th, 112th and 113th Congress, Delegate Christensen served on the Committee on Energy and Commerce. Among other subcommittee assignments, she served on its Subcommittee on Health during healthcare reform. She also served on Committee on Homeland Security and Committee on Natural Resources - Chair of the Subcommittee on Insular Affairs, Wildlife, Oceans and Fisheries - and the Committee on Small Business. Congresswoman Christensen chaired the Congressional Black Caucus’ Health Braintrust for 16 years. She is a Graduate of the George Washington School of Medicine and completed her residency in family medicine at Howard University Medical Center - then Freedman's Hospital. Congresswoman Christensen began her medical career in the Virgin Islands in 1975 as an emergency room physician and became a board certified family physician in 1977.